Chernobyl: Life In The Dead Zone: The site of the world’s worst nuclear accident was hastily abandoned by panic-stricken humans over 20 years ago. Only a number of house pets and indigenous wild animals remained. To the surprise of scientists, they not have not only survived, but thrived. In the documentary they where showing how nature was getting back that area that cannot be populated by humans anymore. Surprisingly, it seems that the suspected genetic mutations have been really rare and many species are not only surviving but increasing in numbers. It seems that the complete food chain has been reestablished. Dears, wolfs, bears and all sort of wild animals of all dimensions are proliferating and taking control of the area, visiting the ruins of houses, schools and so on. I found interesting the story of a cat that was still living by the ruins of a house (where probably its ancestors where living). The cat is now acting as a wild animal, hunting for feeding the kittens. Fighting and strategizing for protecting the kittens from the wolfes. In summary, it seems that mother nature can reestablish life where humans have been able to take life away. Talking about this with a friend he pointed me to this website by Elena Filatova. 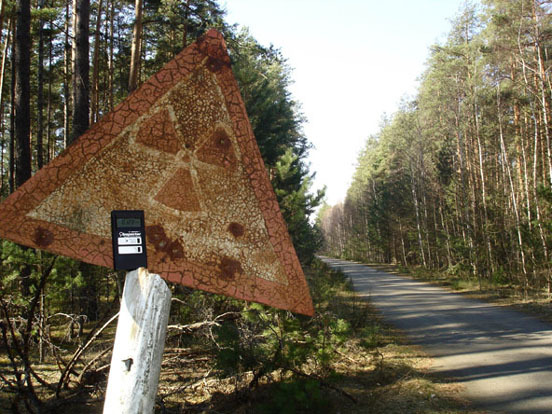 The website collects pictures of the Chernobyl area taken in the last years. Elena wrote: If I had to express what I do in Chernobyl in a few words, I’d say, from year to year I only observe how world of materials objects dissolve into nothingness.